At A-1 Automotive we can take care of all of you car or light truck tire needs. We have a Coats tire machine that can handle up to 26” wheels. We also can handle your run flat tire needs. We have a Hunter Wheel balancer . 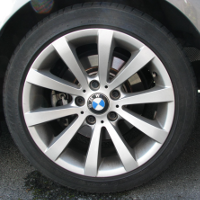 We will repair flat tires along with provide an array of replacement tire choices. These choices include BF Goodrich, Cooper, Toyo, Hankook, Firestone, Michellin and many others. Along with taking care of you tire needs we can inspect you suspension and do a 4 wheel computer alignment to keep those tires lasting a long time . We also offer free rotation on every set of 4 tires we sell when we change your engine oil. This does exclude dual wheel vehicles.